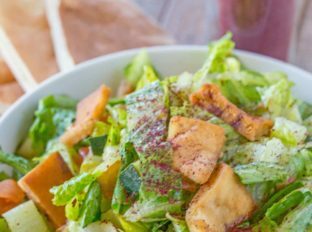 Middle Eastern Fattoush Salad made with home fried pita bread, lettuce, cucumber, tomatoes and a lemon sumac vinaigrette, this salad is the perfect side dish to your favorite kebab recipes. We love to serve this Fattoush Salad with Middle Eastern Chicken Kebabs (Shish Tawook) and Lemon Greek Chicken Skewers with sides of Tabouli Salad or Baba Ganoush for the perfect Middle Eastern Meal. We love Middle Easten food because the flavors are so bold and the recipes are still so easy to make. Most of the recipes I share tend to use easy to find ingredients (which I do intentionally), but this recipe includes a very unique spice called Sumac. What do you use Sumac for? Sumac is a delicious lemony, bright flavored and slightly sour spice that adds a HUGE punch of flavor. It is most commonly served in this Fattoush Salad, over Persian rice or on grilled kebabs, usually made of ground beef (kofte kebabs). Sumac is a dried berry that is dried and turned into a powder. Many traditional recipes call for sumac in place of lemon as it was used for years as a substitute for lemon when lemons were unavailable. What can you use instead of Sumac? The most commonly used ingredient in place of sumac is lemon zest. When zesting a lemon just be sure you don’t get any of the white pith. The white spongy texture located just under the skin of the fruit is incredibly bitter and not generally considered edible unless it is candied. Low Carb Pita Bread is used here to make the signature part of the fattoush salad, the crispy pita bites. Since we’re frying them in oil and making them crispy we can cut down on points using a low carb option. The entire pita bread is just 3 points per serving. Growing up my family kept it simple with lettuce, cucumber and tomatoes. 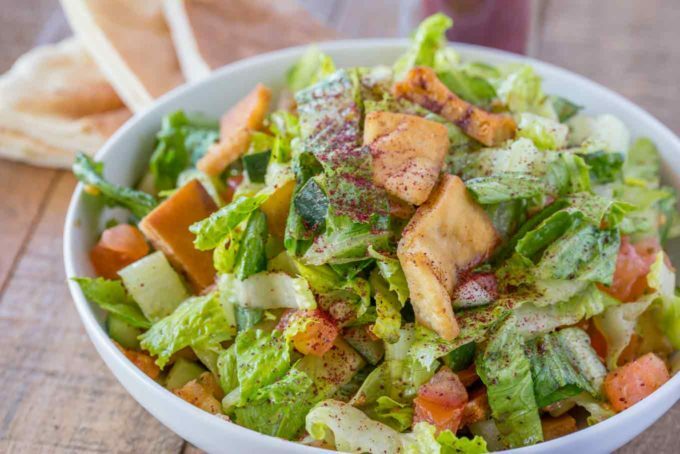 In restaurants you will commonly find that fattoush salad is served with kalamata olives, feta cheese, red onions, chickpeas and even bell peppers. To add bulk to your salad you can certainly add more ingredients, just be cautious of the point values. I personally would bulk it up with red bell peppers. 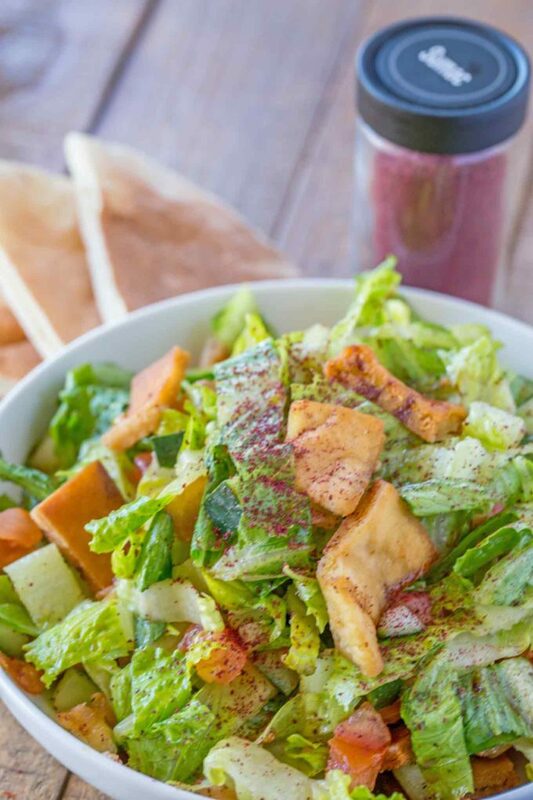 Fattoush Salad dressing is customarily made with olive oil, lemon juice, salt, pepper, garlic and sumac. Mint is a prominent flavor in the salad which permeates through the dressing, but the mint is not added in with the dressing when whisking as it would bruise the leaves to whisk them. To a skillet at the canola oil on medium high heat. Add in the pita bread and fry the pieces until crispy. Allow to cool while you assemble the salad. Add the olive oil, lemon juice, garlic, salt and pepper to a small bowl and whisk well. Toss with the salad ingredients, top with the pita chips and sprinkle sumac over the salad. Perfect summer dish!! Looks fantastic ! I would love to try this! The flavor sounds so interesting! I am wanting a big bowl of this right now. 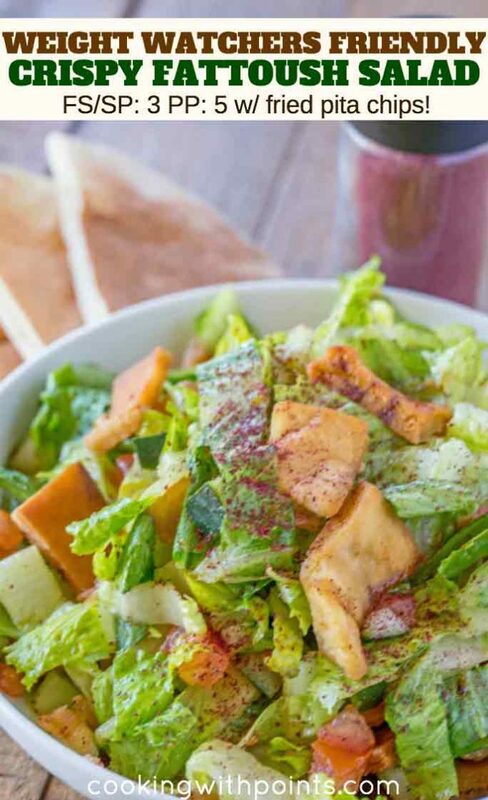 Fattoush salad is one of my favorite things on earth! This looks incredible! Very good! I made this with the Shish Tawook chicken and they were both delicious! I don’t know anything about Middle Eastern cooking but they were both easy to make, fresh, and flavorful! I’m doing Weight Watchers and this is my new favorite recipe website!